Since B started N1 (nursery) in January, he hasn’t stopped singing about Letterland. 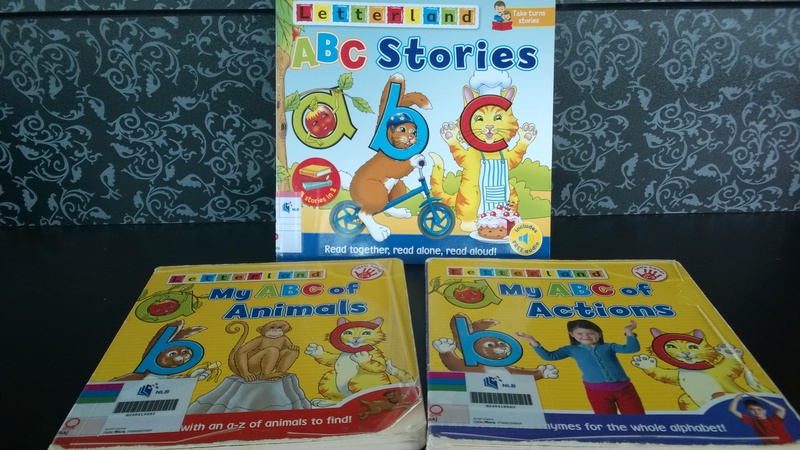 To find out more, we borrowed some Letterland library books. But it wasn’t till this weekend, when a few of us “lucky” parents attended a workshop by the school, that I finally understood what B’s been going on about every week … ! With Letterland, children are taught the shapes and sounds of letters by assigning them to imaginary pictogram characters living in a fictional land. Letterland engages children across all learning methods (visual, kinesthetic, auditory, speech) with songs, stories, actions, hands-on activities and even online software. 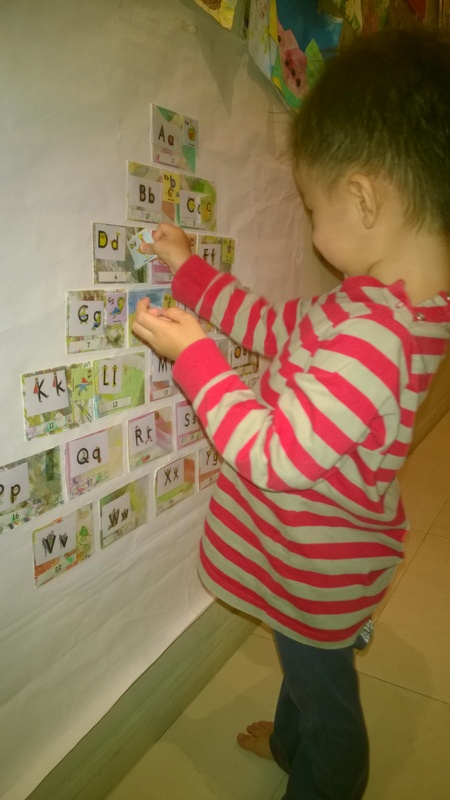 The stories also creatively and thoughtfully explain the reasoning behind sounds, shapes, reading and writing direction for individual letters, blends and digraphs. This makes it easier and more intuitive when kids progress to word building, reading and writing. Overall, Letterland is a comprehensive synthetic phonics and story-based system. When first introduced, the songs also link back to the alphabet names so that kids who already know their alphabet won’t get confused. Thumbs up for a fun, memorable AND informative approach. Read here for more. 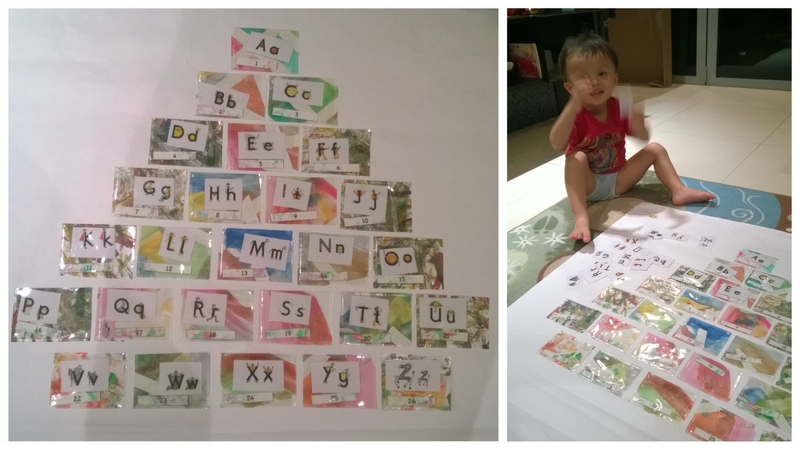 Here’s how we made it: Cut out some old artwork in small rectangles for the base and use double sided tape to stick plastic pockets on (you can use card organiser / collector sheets from Popular). Print out Letterland letters and characters (official downloads from here), laminate and cut out individual letters and add blu-tak to the back so they stick easily. Most phonics systems can be taught from ~18 months on, or earlier if your child has interest (see our first attempt with zoo-phonics). While phonics isn’t the only way to learn to read, and shouldn’t be something you “force” on any kid, it’s quite effective if you’ve got a child who’s interested in words from the books and print (s)he’s exposed to everyday. Even if you’ve no time for lots of crafty, highly engaged projects, consider enhancing your preschooler’s learning with BOOKS and if needed, educational material from online distributors like NoQ, Elm Tree or the many free downloads and printables online. A wonderful world of words that will feed their knowledge and imagination lies ahead once they “crack the code.” Happy reading! For updates, reviews and more, like me at Finally Mama on Instagram. Yeah, and all the songs sound similar, too 🙂 I find it hillarious to hear their versions vs the original though. B sings “Harry hat man whispers h… he never talks out loud” and then B shouts real loud at the end. Hmm.